In May, I went through a couple of cell phone amplifiers. I moved away from my Wilson amplifier, as I needed something that supported a number of clients/networks at once and simultaneous transmit/receive. I then spent almost $600 on the Max Signal cell phone amplifier. It was touted as a great device, but I never was able to get it to function right in my vehicle setup. You have to have a certain amount of separation between antennas, and it seemed too finicky. Enter SureCall. I first picked up a Fusion2Go amp, after a recommendation from my friend Steve Polley. I was instantly blown away. I had full control over each cell phone band and was able to fine tune my amp to turn things up/down so it would run smoothly. I could watch it auto adjust its power to prevent issues, etc. After a few weeks of use, I got in contact with SureCall and was sent a new unit, the Fusion2Go 2.0. This amp is smaller and smarter. It’s able to control it’s power outputs and it’s always running clean and green. I get a solid boost in signal across all my devices (and networks) almost instantly when turning on the device. I personally bought a new external antenna that is drilled into the roof, but the antenna that comes with the v 2 seems to have a shorter, stubbier, antenna that is less likely to blow off in the wind. 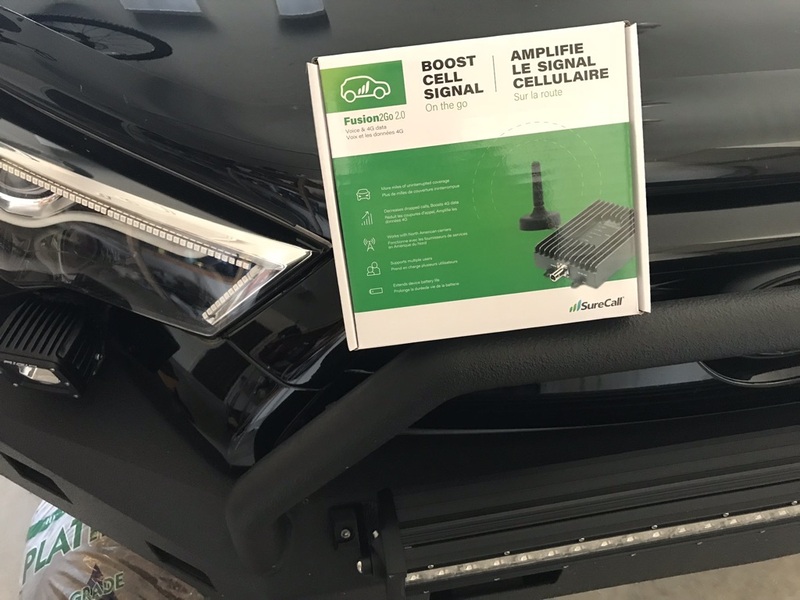 With improved performance, a smaller footprint and auto-adjusting gain, Fusion2Go 2.0 provides the maximum gain and power possible for a vehicle cellular signal booster, ensuring seamless connectivity while you’re on the go. Standard setup with internal antenna, and a default small mag mount antenna. Like other amps, I got best signal boost when placing my devices in very close proximity to the internal amplifier patch antenna. Here you can see V1. There are dials for each band to adjust the power as needed. This is awesome, but if you are like me, you want to be able to just plug and go, and potentially even hide the amp. The buttons are a great idea for some applications, but for me, storm chasing, I want it to just work… That’s why V2 rocks! ← August Smart Lock: Control Your Home Lock from Anywhere!